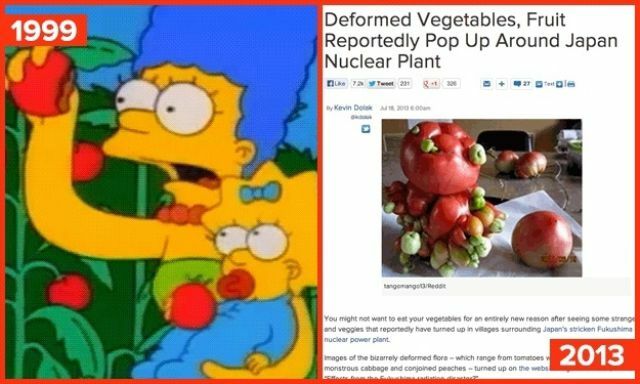 In 1999, radiation spawned mutant tomatoes. In 2008, Homer’s voting machine changed his vote. In 1995, an entire lemon tree was stolen. In 1995, Lisa’s “future” fiancé could verbally communicate with his watch. In 1994, horse meat was a secret ingredient. In 1998, Professor Fink made hamburger earmuffs. In 1994, an Apple product wasn’t always sure what its owner was trying to say. In 1991, Ringo took decades to respond to his fans. In 1998, Springfield kids were stoked about a yard work simulator. In 1995, Lisa’s “future” college librarian was a robot. In 1992, Herb Powell built a baby translator. In 1995, a “future” dorm room had a Rolling Stones tour poster. In 2002, before “Guitar Hero” existed, Mick and Keith gave Homer a “Guitar Hero” jacket. In 1991, Homer dreamed of the Land of Chocolate during a meeting. In 1996, a high-tech intercom looked exactly like what would become the 1st generation iPod. In 1993, Gunter and Ernst were attacked by one of their tigers. In 1998, Homer stole used cooking grease to turn into quick cash. In 1995, “future” phones had video capabilities. In 2009, a sign was not a cop. And in 2007, Homer did that thing.